While we were in Schoharie County, rambling through the deep, mysterious recesses of the subterranean (Howe Caverns! 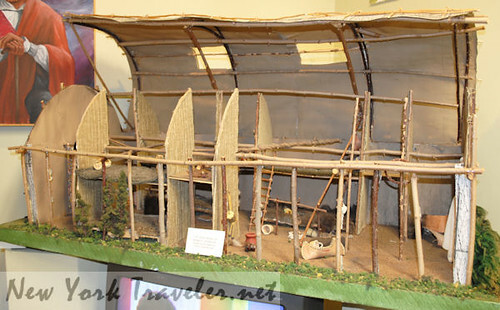 ), I discovered another attraction nearby: Iroquois Indian Museum. I grew up in New York State, ancient land of the Iroquois Nations, so their history has been drilled into my skull endlessly since my school years. As a homeschooling mom (and New York traveler extraordinaire), the Iroquois history has become familiar territory. 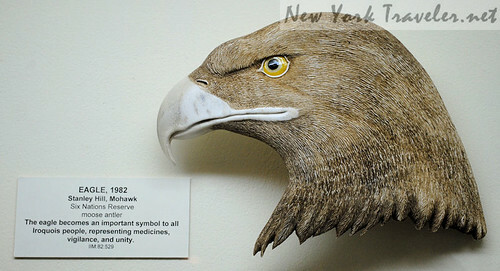 We’ve been to the Shakowi Cultural Center in Oneida, gone on an extensive search for the Oneida Stone, learned about the history of Hamilton College (originally built to educate local Indians and white settlers for the ministry) and Reverend Samuel Kirkland‘s house, paid our respects at the Oriskany Battlefield monument, and on and on and on! 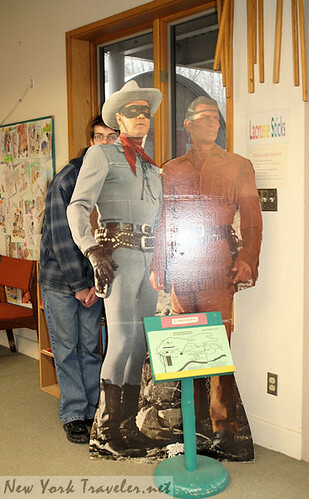 The Iroquois Indian Museum is unlike any of the other places I visited. 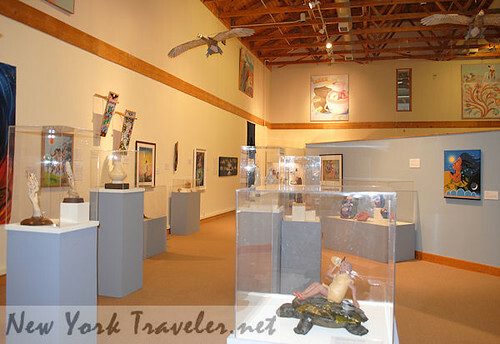 The artifacts and art displays mingled Indian culture and it’s development with the history of the Iroquois. In case you have never heard of the Iroquois, allow me to briefly introduce you. 🙂 The Iroquois Nation consisted of five (then later, six) tribes of the Eastern Woodlands natives of North America: the Mohawks, Oneidas, Onondagas, Senecas, Cayugas, and later, the Tuscaroras from Carolina. These tribes make a peace agreement with each other and were allotted tracts of land stretching across the untamed wilderness of what we now know as Upstate New York– the Mohawks were the “keepers of the door” near Albany and the Senecas maintained the other end of the land. What made the Iroquois so unique was their form of self-government. 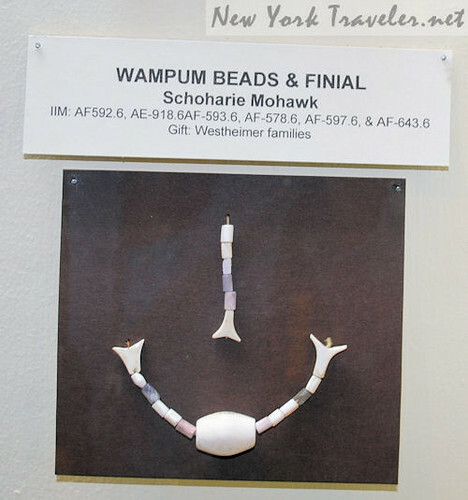 When other tribes across the land were still hunting and gathering and slaughtering buffalo and each other, the Iroquois made a pact and recorded it with wampum (a belt of beads made from seashells). 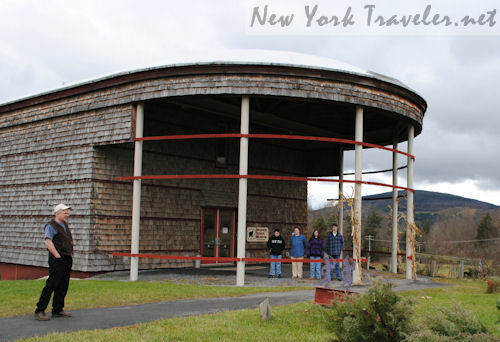 The Iroquois Indian Museum is an amalgam of modern Indian art from local artists and artifacts discovered throughout New York State. Oh, how I remember as a little girl, digging in my yard looking for arrowheads! 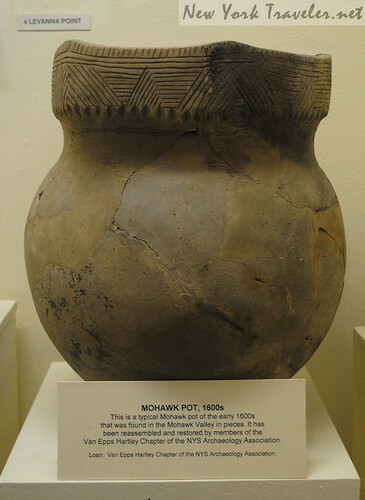 An old Mohawk pot, reconstructed from shards. A modern work of art crafted from a deer antler. 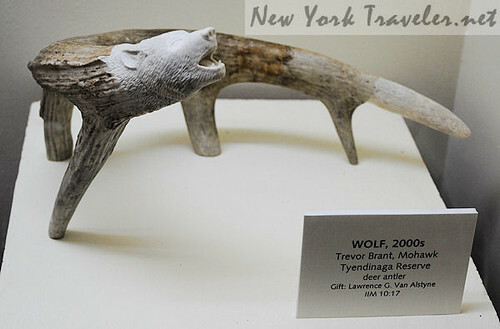 This is an amazing sculpture from a moose antler! Indian beadwork from the late 1800s. The ladies of the Iroquois nations still make such lovely beadwork. I saw many such items for sale at the New York State Fair this year. Wampum beads. It was difficult to tell what articles were new and what were historic. Iroquois women used to decorate their pottery just like ladies still love to do, today. 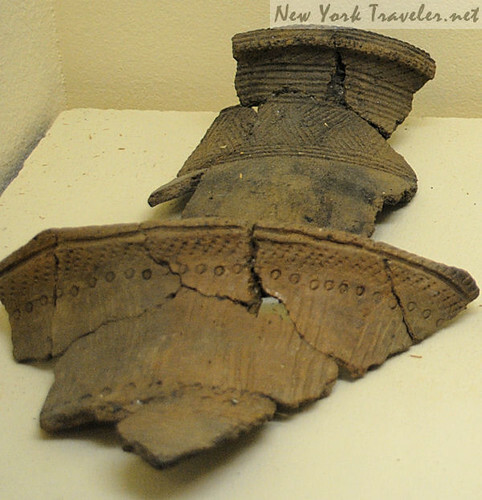 The placard said that you could always tell what tribe pottery came from because the designs were unique to the groups. The Iroquois Indian Museum has two levels. One is filled with such amazing artifacts and art work. The lower level is for kids. There’s a big turtle pond that my son loved– the turtles were rather friendly and swam up to him. Or maybe my son just has this *knack* with turtles, I don’t know. There are “hands on” activities, tables with coloring sheets, a few televisions playing Iroquois-related documentaries, and a booth for dressing up. There is an admission fee to the museum, and the museum closes January 1st. It reopens in May and is open every day except Monday until November. 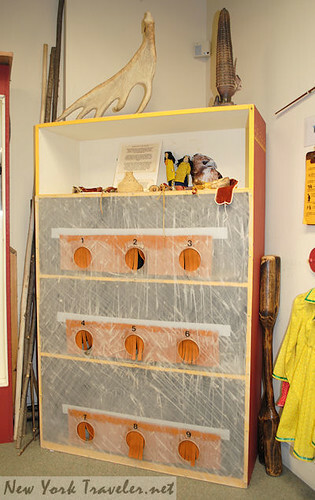 For more information, visit www.iroquoismuseum.org.